Wow. So my last post was eerily timely, huh? But just as I said in that post, I will continue to go forth and blog…while I pray and pray…and pray some more for Paris and the rest of this world of ours. God bless. 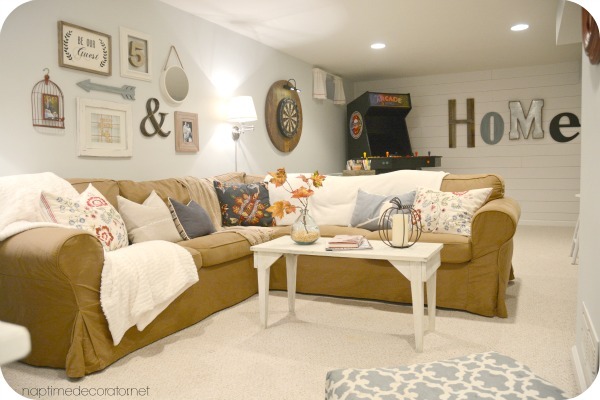 If you recall from the Basement Makeover Post, there were too many components to discuss in detail for one post, so I said I’d break it down into lotsa little ones…I do believe this is the LAST ONE! 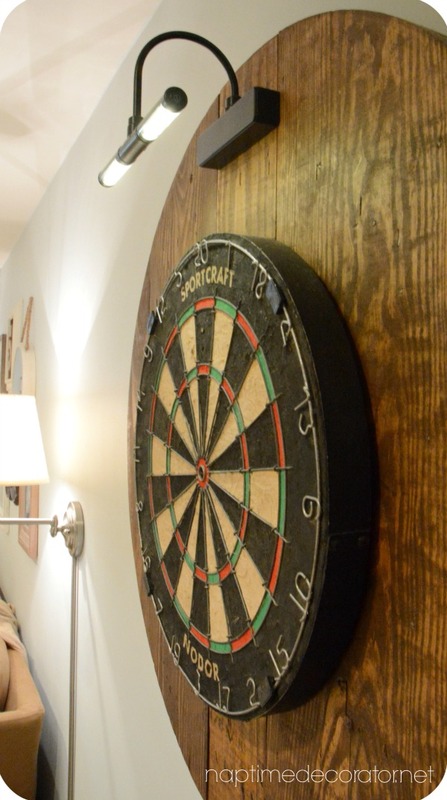 …and this DIY Dartboard Project ought to complete this list! This was a fun one…and 100% my husband’s idea. And SUCH a good one! 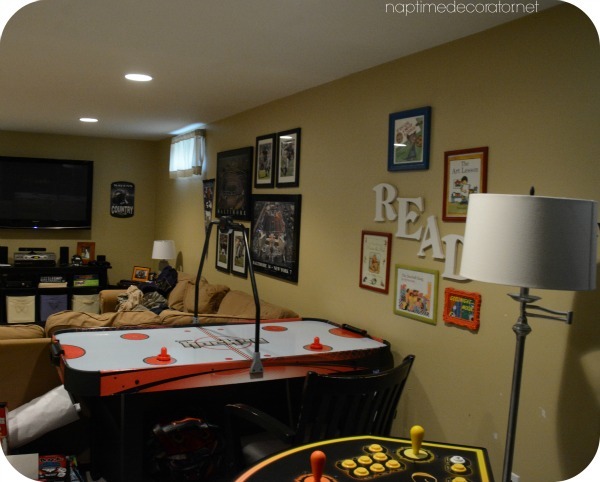 If you saw the makeover, you know it all started with the beast of an arcade machine. So obviously, I had to roll with a fun, playful vibe, you know? If you can’t beat ’em, join ’em! 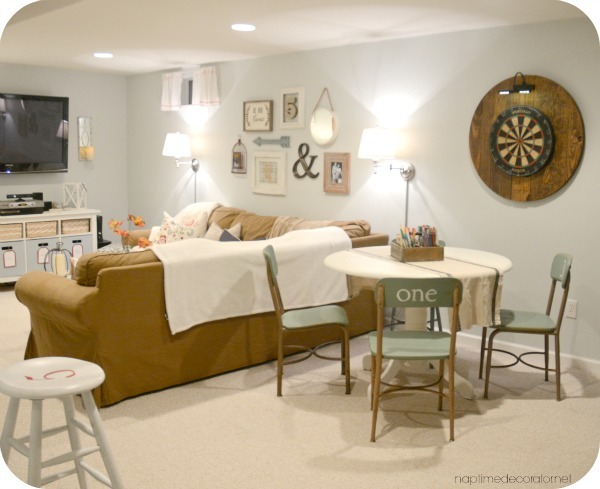 Now, we aren’t exactly huge dart players, but it looks fun, and when the kids aren’t around, and the grown-ups get to hang out down here, it’s a good time. Other than the $2.99 dart set and battery operated light, it was 100% F-R-E-E! 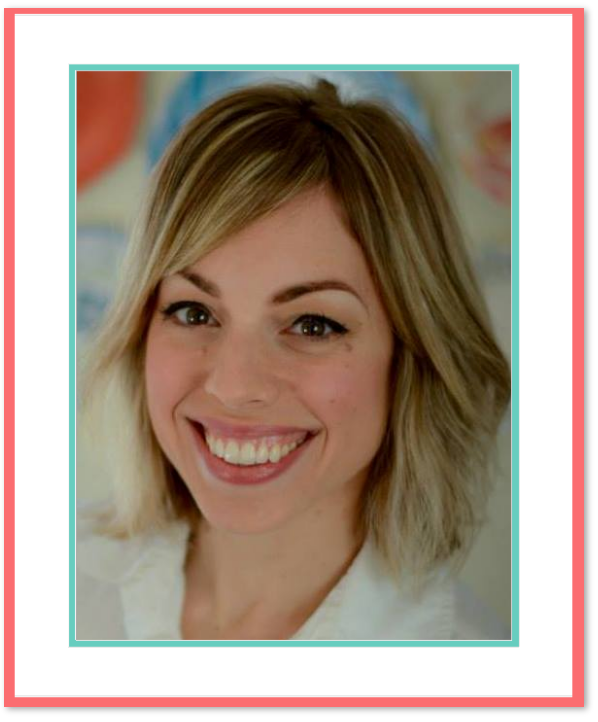 Let me tell you how this all came to be…with spending barely a thing! Our next door neighbors moved out over the summer. Awesome couple who raised a family here and were now at the downsizing stage. 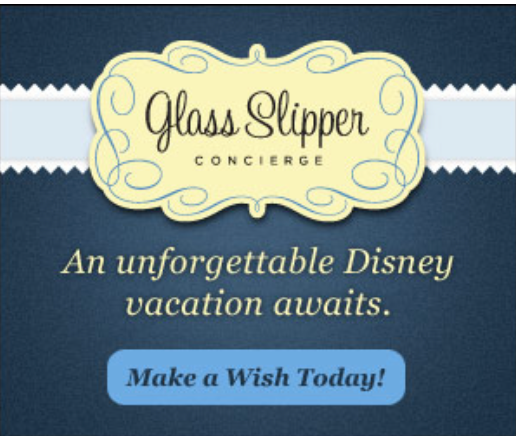 So that meant for all of us: TONS of stuff thrown on the lawn that they were tossing! Seriously, they were begging us to loot through everything and help ourselves – less they had to figure out what to do with! 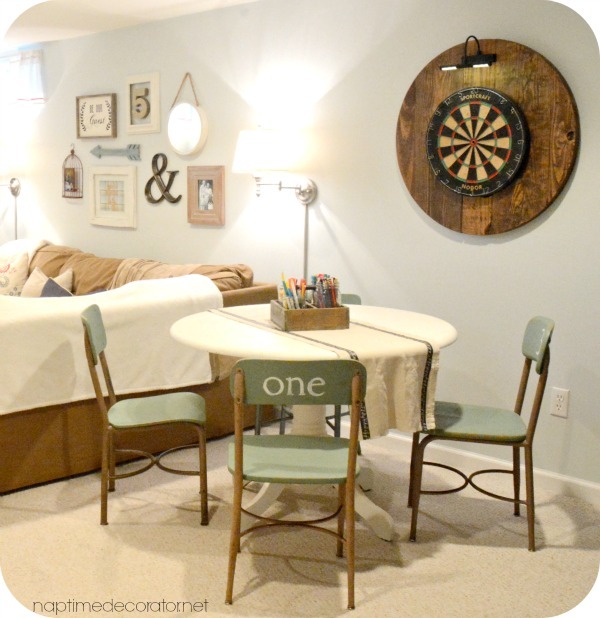 I spotted this dartboard – it was old and lovely and just the right addition to the playful basement I was smack dab in the middle of redecorating. Wasn’t sure where it was going, but I knew it was staying with us. Enter my husband who works in an industry where they have loads of cable reels laying around. He texted me a pic one day and asked if I thought it would work for the dartboard? 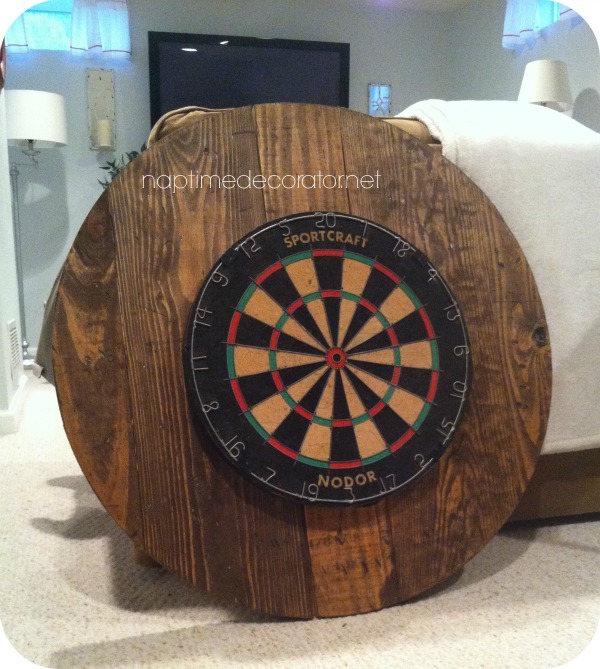 We could stain it, mount the dartboard, then hang it up? I was totally down with this idea. He just had to pop some staples out that were sticking out, and hammered down some that he couldn’t, then sanded it just a bit. I loved that the words and staples still remain – looks so weathered and beat up and lovely. I stained it with Minwax Special Walnut, and then it was time to hang this HEAVY puppy. He mounted one of those sliding picture frame mounts on the back of the dartboard to get it nice and secure on the cable reel. After much googling, he found this incredibly heavy duty frame bracket that would be perfect, and made sure to attach to the studs. He found a battery operated light on Amazon to attach for a nice little touch, and that was it! That READ wall is where the dartboard is now, in case that’s not clear in this hodge-podge wonderland that was the old basement. 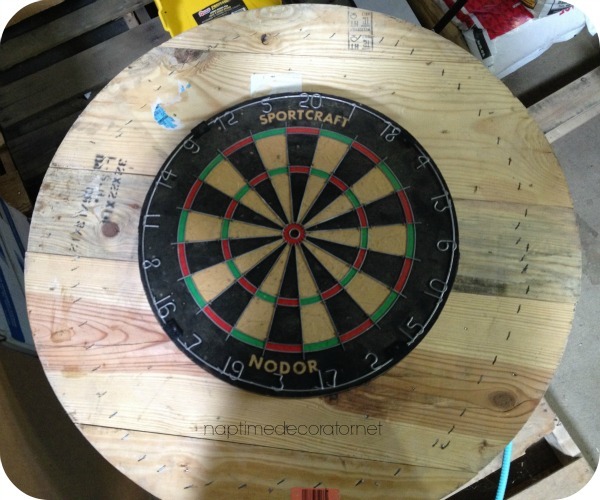 See what I mean about the single, large, round dartboard to fill the space, rather than more of the same? I am SO glad my husband thought of this cool idea, and how awesome that it barely cost a thing!? I’m happy to say I got a FREE 42in cable reel and will begin my DIY this weekend. Eeek! One end of the reel will be a dartboard backing like yours, and the other will be a very large clock. I will probably stain the dartboard similar to yours, but I’m playing with the idea of a teal stain for the clock. Wish me luck! My husband ordered it on Amazon I believe – sorry, been a while so I don’t remember exactly! Hi, brilliant idea. Definitely doing this. 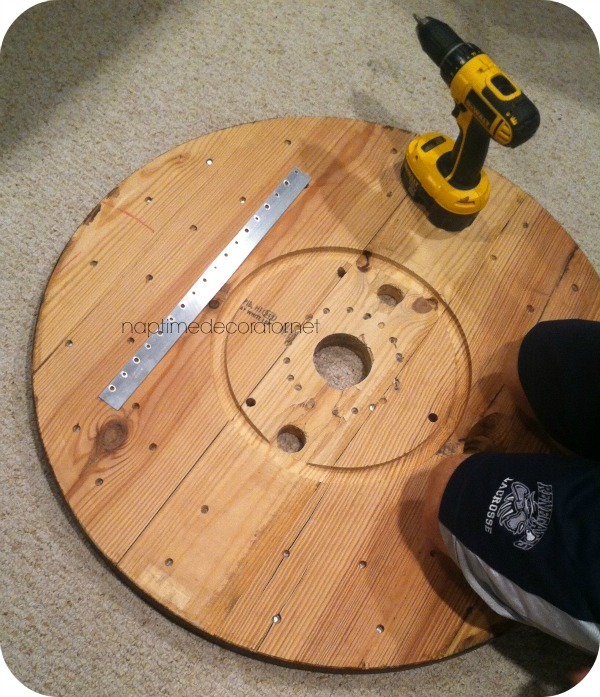 Could you tell me what the diameter of the cable reel wooden board is? Looks about 900 to me.